While volunteering is good for those in need, the giver cashes in big on generosity, too. Studies show the benefits of generosity and volunteering include a heightened sense of well-being, increased self-worth, and improved emotional and physical health. These good feelings can mean good things for your immune system. Generosity and volunteering produce hormones that relieve stress, promote happiness, cause a natural high (endorphins), and promote bonding and tranquility. All of these factors have been shown to lower inflammation and help manage autoimmune diseases such as Hashimoto’s hypothyroidism. Being generous makes us feel better about ourselves It builds confidence, and encourages us to focus toward the world rather than ourselves. When we improve someone else’s life, empowerment grows and we are better able to deal with life’s hardships. This can include better weathering the ups and downs of dealing with any disease. Generosity and volunteering also lower mortality rates, reduce cardiovascular risk, decrease anxiety and depression, and improve sleep. By improving your overall health and well being, you are better able to manage your Hashimoto’s hypothyroidism. In fact, one study showed adults who volunteered at least four hours a week for one year were 40 percent less likely to develop high blood pressure compared to non-volunteers. Another study of teens found those who spent an hour a week helping children in after-school programs had lower levels of cholesterol and inflammation than their non-volunteering peers. Don’t volunteer or be generous simply out of obligation in order to improve your health. If you want to enjoy the health benefits of generosity and volunteering, it must be genuine. Make sure you’re focused on helping others and not just looking good. 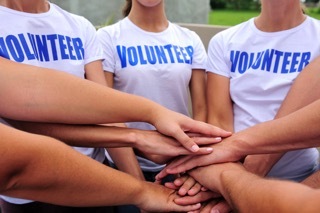 A 2012 study found that older volunteers had a lower risk of dying in a four-year period than non-volunteers, as long as their volunteerism was for altruistic and not self-oriented reasons. Offer to do something your enjoy. Help with a cause you’re passionate about. Be realistic about your schedule so you don’t stress out. Volunteer with others so it’s socially beneficial. Don’t give up if your first attempt is a bad match. Remember, generosity and volunteering are good for everyone. Other people you know may also have a chronic health condition they are working to manage. If someone is generous to you, please don’t brush it off or feel undeserving — receiving kindness with sincerity and grace if a gift in itself. This will bring you closer to the person and allow them reap the benefits of giving as well.